Listen to “Talk 2 Her” here. Sam Coffey & The Iron Lungs have been working on this LP for almost two years. Their previous album, Gates of Hell, released on Oakland punk/garage label Southpaw Records (Ty Segall, Young Guv), received praise from outlets like Pitchfork, Spin and Noisey, and saw the band tour extensively, playing with Red Kross, Black Lips and Screaming Females, and becoming regulars in DIY scenes up and down the East Coast, but for their follow up the band sought to build upon the lo-fi aesthetic of their earlier releases and push themselves beyond their garage roots. They began working with producer Alex Bonenfant (METZ, Crystal Castles), who brought them into a proper studio for the first time, and they embraced their abiding love for, and near encyclopedic knowledge of 70’s power pop, in the process honing a potent brand of guitar music that draws influence from a broad swath of the genre’s history. 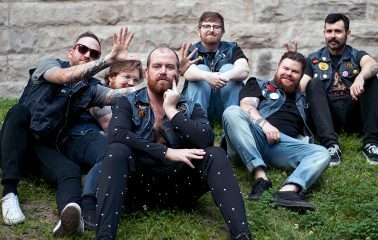 Sam Coffey & The Iron Lungs comes out on July 28, 2017 and the band will be touring to SXSW this week. Full details can be found below. Sam Coffey & The Iron Lungs will be released on Burger Records and Dine Alone on July 14th.